Use these portable track saws to make long, straight cuts where space is limited. Like circular saws, track saws can be fed into the workpiece to begin the cut. Unlike circular saws, track saws can also plunge cut into the workpiece. 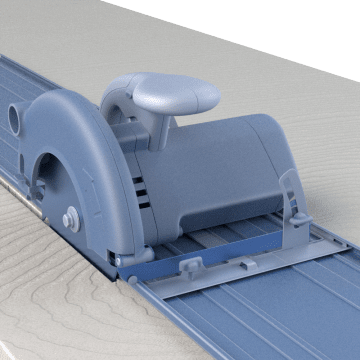 Track saws fit into a grooved track, ensuring precise cuts. They are typically lighter and easier to transport than table saws and easier to set up and align than circular saws. The saw blade tilts to make beveled cuts, and the track can be placed at any angle for making long miter cuts.